Winters are long and cold at MoJazz headquarters in Idaho. Porting heads in the shop and riding dirt bikes over snow-covered dunes only go so far in addressing our need for two-wheel antics during the cold, dark months between November and March. To cope we trailer bikes to destinations well south of the 43rd parallel for adventures in more simpatico climes. Sometimes the weather cooperates (right) and sometimes it does not (below). Our mixed history of success aside we here at MoJazz are, if nothing else, persistent. Hope springs forth eternal and all that. So trips south around the new year and during spring break are annual rituals. 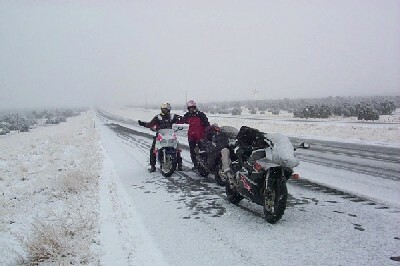 One of our favorite spring break rides is a loop of Utah, Nevada, and Arizona around the Grand Canyon. The ride begins in St. George, Utah because it's usually the first place warm enough to convince us to unload bikes. The Flying J in St. George has short term truck parking making it a perfect place to leave the truck and trailer. The first part of the tour is a blast down the I-15 freeway some 120 miles to Las Vegas. From Vegas the route swings south on US 93 to Boulder City and the Hoover Dam. The Hoover Dam is well worth taking the time to visit turista style. Somehow we usually manage to arrive just after dark but are well compensated for missing the tour by the fact that the Hoover Dam, at night, is simply spectacular. From Hoover Dam it's another 70 miles to Kingman, AZ. Kingman is Route 66 territory. It's a great place to spend some time. Be sure to check out historic Route 66 as it winds through town and don't miss the Visitor's Center and gift shop on Andy Devine Ave. The route west from Kingman follows the original Route 66 roadbed paralleling 1-40 for about a mile. The route then turns right crossing railroad tracks and under the interstate. Take the first left on the other side of I-40 and you're on your way to Sitgreaves Pass and the historic town of Oatman some 25 miles ahead. A few miles west of Oatman the road splits. The Route 66 roadbed bears left and heads toward I-40 at Topock some 30 miles to the south. The last few miles of this section of the route is otherworldly - winding along the Colorado River through cattail festooned marshes in the middle of an otherwise completely burned over desert. The next jog is east on I-40 to exit 9, then south 21 miles along AZ 95 to Lake Havasu City - current home of the London Bridge. A scenic 42 miles south along the Colorado River lead to Parker. Some 12 miles south of Parker the route turns left and goes southeast 35 miles along AZ 72 through Bouse and Vicksburg intersecting US 60 at Granite Pass. From here the route heads northeast through Salome and beyond another 50 miles to Aguila. A mile or so northeast of Aguila the route veers left on AZ 71 and proceeds 18 miles to an intersection with US 93. Another 6 miles east to Congress and an intersection with AZ 89 and the fun begins. The next 44 miles to Prescott are what motorcycles are made for. Try to restrain yourself. Navajo Bridge. The Vermilion Cliffs are in the background. A few miles north of Prescott the route takes a right and heads east along 89A to Jerome and Cottonwood. This is another spectacular section of highway that is both twisty and incredibly scenic. One of the more bizarre wildlife encounters I've had on a motorcycle was along this section of road a few years ago. About an hour after dark one night, midway up the pass at Mingus Mountain, I encountered at the apex of a corner a full-grown cougar in the middle of the road completely nonplussed by an Akrapovic exhaust at full tilt boogie. From Cottonwood the route continues north through red rock country to the tourist mecca of Sedona. North up the Oak Creek Canyon another 30 miles lies Flagstaff. From Flagstaff there are two northbound options depending on road conditions. If the road is open it's worthwhile to take US 180 northwest out of Flagstaff to AZ 64 and the South Rim of the Grand Canyon then back to US 89. Otherwise the route goes north on US 89 some 90 miles to an intersection with ALT 89. ALT 89 proceeds west over Navajo Bridge along the Vermilion Cliffs some 40 miles to Jacob Lake (30 miles North of the Grand Canyon). From Jacob Lake ALT 89 heads north toward Fredonia. The infamous polygamist enclaves of Hilldale-Colorado City straddle the Arizona-Utah border 30 miles west along AZ 389. Unless you really want to see 10 bedroom ranch homes with no siding continue to head north from Fredonia to Kanab, UT. From Kanab the route goes north 18 miles to Mt. Carmel Junction. Here UT 9 heads west through Zion National Park. A few miles from the west entrance to the Park lies the town of Hurricane. From here it's a short jog west back to I-15 and a few more miles south to St. George. The total length of the loop is 900 miles and change, depending on the exact route taken.